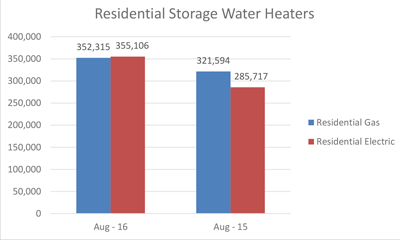 U.S. shipments of residential gas storage water heaters for August 2016 increased 9.6 percent to 352,315 units, up from 321,594 units shipped in August 2015. Residential electric storage water heater shipments increased 24.3 percent in August 2016 to 355,106 units, up from 285,717 units. For the year-to-date, U.S. shipments of residential gas storage water heaters decreased 8.4 percent to 2,844,860, compared to 3,105,321 shipped during that same period in 2015. 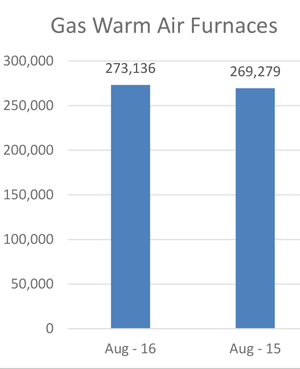 Residential electric storage water heater shipments decreased 6.5 percent year-to-date to 2,680,420 units, compared to 2,865,703 shipped during the same period in 2015. Commercial gas storage water heater shipments increased 18.5 percent in August 2016 to 8,028 units, up from 6,776 units shipped in August 2015. 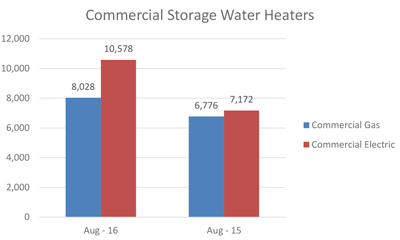 Commercial electric storage water heater shipments increased 47.5 percent in August 2016 to 10,578 units, up from 7,172 units shipped in August 2015. Year-to-date U.S. shipments of commercial gas storage water heaters increased 0.5 percent to 67,204 units, compared with 66,847 units shipped during the same period in 2015. Year-to-date commercial electric storage water heater shipments increased 47.1 percent to 83,681 units, up from 56,904 units shipped during the same period in 2015. 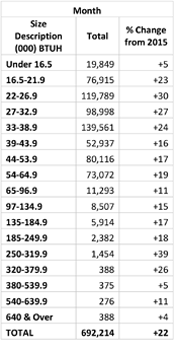 U.S. shipments of gas warm air furnaces for August 2016 increased 1.4 percent to 273,136 units, up from 269,279 units shipped in August 2015. 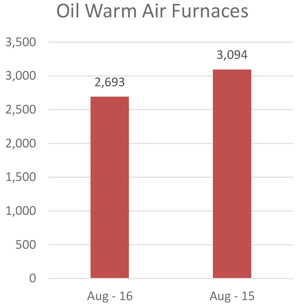 Oil warm air furnace shipments decreased 13.0 percent to 2,693 units in August 2016, down from 3,094 units shipped in August 2015. Year-to-date U.S. shipments of gas warm air furnaces increased 4.7 percent to 1,792,768 units, compared with 1,712,258 units shipped during the same period in 2015. 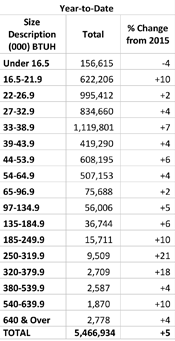 Year-to-date U.S. shipments of oil warm air furnaces decreased 5.9 percent to 17,975, compared with 19,101 units shipped during the same period in 2015. U.S. shipments of central air conditioners and air-source heat pumps totaled 692,214 units in August 2016, up 22.5 percent from 565,252 units shipped in August 2015. U.S. shipments of air conditioners increased 21.2 percent to 477,436 units, up from 393,798 units shipped in August 2015. U.S. shipments of air-source heat pumps increased 25.3 percent to 214,778 units, up from 171,454 units shipped in August 2015. 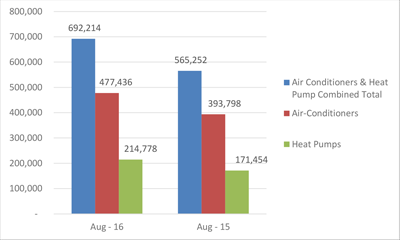 Year-to-date combined shipments of central air conditioners and air-source heat pumps increased 4.9 percent to 5,466,934 units, up from 5,212,622 units shipped in August 2015. Year-to-date shipments of central air conditioners increased 6.3 percent to 3,710,251 units, up from 3,489,113 units shipped during the same period in 2015. The year-to-date total for heat pump shipments increased 1.9 percent to 1,756,683 units, down from 1,723,509 units shipped during the same period in 2015.